The Cleveland International Film Festival has become an important part of our recent history. In celebration of the festival's 34th anniversary, here are a few clips from movies that were filmed in and around Cleveland. This classic comedy starring Jack Lemmon and Walter Matthau was the first major commercial film made in Cleveland. This educational film, credited with kicking off the era of the filmstrip, was filmed at Mercer Elementary School in Shaker Heights. It contains some good footage of 1960s-era Shaker Heights streetscapes and school buses -- not to mention people! (Source: Archive.org). Probably the quintessential "it was filmed here!" movie, which features St. Theodosius Russian Orthodox Church in Tremont. This all-but-forgotten rock and roll family drama starring Joan Jett and Michael J. Fox is set against the backdrop of Rust Belt-era Cleveland. Unfortunately the movie is not available on DVD, but there is one VHS copy still floating around in the CLEVNET library system. 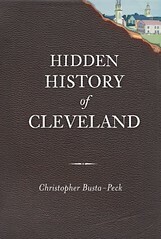 You can also check out the Plain Dealer's list of movies that were filmed in Cleveland, and read more at the Encyclopedia of Cleveland History. Great post! Cool to focus on some older stuff! There is also the ubiquitous "A Christmas Story," "American Splendor," and "Welcome to Collinwood." Every year at Christmas my dad talks about how exciting it was when they were filming A Christmas Story on Public Square: "it looked just like the 40s!" I think one of his coworkers was actually an extra in that movie. Shamefully, I have still never seen Welcome to Collinwood, although it has been in my Netflix queue since 2006! Where does that staircase go? Create Your Historic Cleveland Area Garden!